The awesome co-hosts for the June posting of the IWSG are: JH Moncrieff, Madeline Mora-Summonte, Jen Chandler, Megan Morgan, and Heather Gardner! 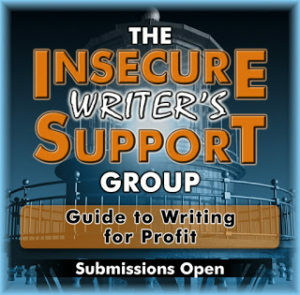 Guidelines: The IWSG Guide to Writing for Profit–This will be a non-fiction book like our Guide to Publishing and Beyond. What to write: Share experiences about making a profit as an author, what it takes to become a successful writer, the many skills a writer needs to learn other than writing, share the experience going from hobby writer to published author (without making it a self-promotion piece), the fallacies behind writing for profit, the little known facts learned along the way, what you wished you knew when you first started writing, or marketing tips based on experience of what has worked and what hasn’t. Please include a title, your name, and a link to one of your sites. Send as an attached Word file or pasted into the email. JUNE 07th QUESTION: Did you ever say “I quit”? If so, what happened to make you come back to writing? No, since I started writing, quitting has never been an option. I may have taken an extended break from writing (definitely unplanned though) but I’ve never considered quitting altogether. I see writing as an ongoing journey that never ends. The fun is in the journey, the destination is just a bonus. By the way, that’s how I arrived at my blog name. What about you? Have you ever been so fed up that somewhere along the line you made a conscious decision to quit? Are you interested in submitting to the upcoming Writing Guide? Happy to read that you would never quit! I love that about you and your writing! KEEP WRITING….. especially those fun and snappy flash pieces. Fed up? No. Exhausted? Yes. Here’s to the seasons of life that allow us to pursue our dreams, and the ones we push through, regardless of how much they keep us from it. I’ve never quit, but like you, have had extended breaks. An ongoing journey – that’s a great description, Michelle. I’ve never quit for very long, but it definitely has crossed my mind a half dozen or so times. Happy writing in June, Michelle! Everyone needs a break now and then. I’m glad you never wanted to throw in the towel completely! Breaks are necessary. For me, it’s in those downtimes that I am most creative. Hi Michelle, glad that you never even thought of quitting. I like what you have said ” The fun is in the journey, the destination is just a bonus.” Its such a wonderful way to sum up our writing life. Good for you, Michelle! I love your spirit. That’s cool about your blog name too…I had no idea. I’ve whined about quitting before, years earlier, when I was getting tons of rejections and there was no light at the end of the tunnel. But that was mostly because I needed reassurance. I can’t imagine doing anything else! Extended breaks, sure. Time spent not writing while thinking through some ideas, definitely. Not actual quittage? Nope. Fantastic for never deciding to quit. Go Michelle! Thank you for your kind comment on my blog. It really cheered me up. Sigh….actually seriously considering stopping at the end of the year or after I finish my 3 WIP projects plus one to finish a trilogy). I’ve never been tempted to quit either. Writing keeps me sane. It’s cool that you’ve never wanted to quit writing. At times, I’ve wanted to quit fiction writing, because I’m too slow publishing books. However, I keep coming back to it. Short films and comics also have my passion, so I’m trying to find a balancing act. I’d be interested in writing a piece for your Writing Guide, probably the topic of switching from a hobby writer to a professional. I couldn’t agree more. Writing is about the journey and the process. When it becomes a job (like when a pub tell you what to write and when they need it…) it isn’t fun anymore. I like doing things my way on my time, lol. Great idea for the anthology. It will be so helpful. Hey Michy. Glad to hear there’s no chance of you quitting! Keep writing! No one in their right mind would want “writing for profit” advice from me. Unless they have some sort of complicated “Producers”-style scam to lose money. Good to know you’re not quitting! 🙂 Keep writing, stay well. I relate to your words! So exciting about the new anthology. Can’t wait to learn from the more experienced. Have a lovely week. Ah…so that’s what the name refers to. Love it! I’ve always loved the name of your blog and now even more so after reading about your journey. Such a great way to look at writing! Extended breaks can be a good thing sometimes – but giving up is impossible! If it were easy, everyone would do it, right? Some days are easier than others, but even when I *quit* I knew on some level I wasn’t really quitting. Onward and upward. Yes, the journey has its own rewards, although reaching the destination is nice sometimes. I considered quitting twice, but couldn’t imagine a life without writing, so I never got around to quitting. Didn’t know that’s how you came up with your blog name, but it totally makes sense. I’ve seen a common theme to many of these posts. We might get frustrated, but quitting is never a serious option. Looks like the long haul it is! I’m glad you’ve never considered quitting! And what a great reason behind the name for your blog. I love it. I have had seasons of not writing, but I could never give it up entirely because it’s the journey I reflect upon to see if I’ve grown. I just wrote about it on my personal blog in a post called Why we write, not even knowing about this month’s question. I guess it’s been on my mind. There are times we need a break from writing, but a break and quitting are two very different things. Writing is something very hard to quit, I would think. Hi Michelle, just wanted to let you know that I’ve nominated you for the Mystery Blogger Award as I hope more people will find your blog.